He was particularly interested to see if there was any evidence of slumping of the polysyrene beads since Jan 2007. When they came the temperature was 20 degrees Centigrade inside and 13 degrees Centigrade outside (we're near the end of a cold southerly snap). 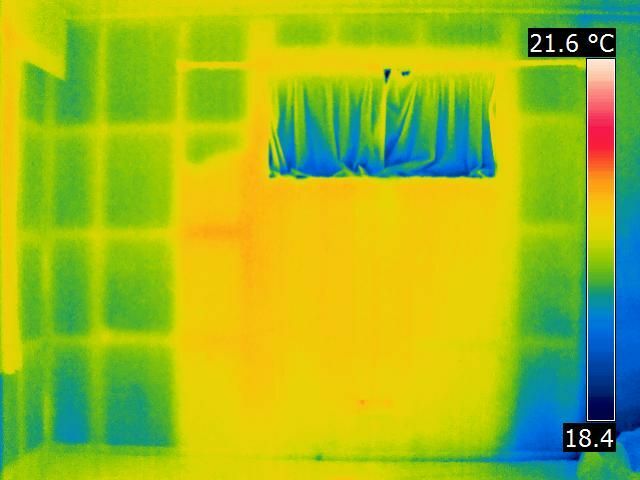 They bought their FLIR P620 infrared camera which produced these images. That's him in the center in white, and his reflection in the middle window. Then on the left is me standing behind the camera photographing the screen. His elbow is measuring 24 degrees. 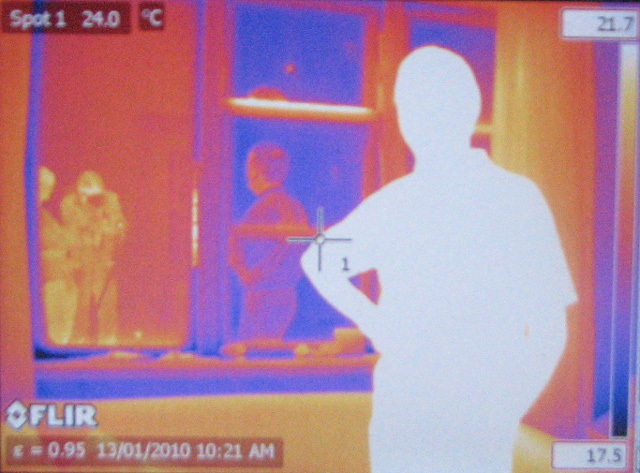 He thinks my real double glazed unit may also have a low-E coating - which enhances the IR reflection. This would be nice - I didn't choose the low-E option when I was buying because it was going to increase the price too much. This is the corner of the lounge, just above the back french doors. the column above the left side seems to have a section at the top that I didn't fill properly. I wonder if there's a hole in the left side stud and beads have fallen thru to the bottom of the next column? to the left of the french doors there is a whole ceiling-to-floor column of cold - that's a section I left empty because there is a power socket down near the floor. The column beside it - in the corner does have insulation. along the edge of the wall and roof it's black - meaning cold. In well-constructed modern super-insulated houses the builders and architects play particular attention to this area. on the left side wall it look's like my insulation is a bit light. This was the first column of insulation I ever filled (with the hair dryer). It may be that the vacuum cleaner blower I used later, with it's greater velocity, does a better job at packing in the polystyrene beads than the hair dryer. Also the left side is the south wall which you'd expect would be colder (in New Zealand). We spent 1.5 hours doing the whole house and found a diagonal bracing beam that caused me to leave some gaps. He used 16mm holes on the interior walls (he experiments with a range of hole sizes to find the smallest size that would still allow the beads to flow well. This means a lot less effort drilling the holes and filling than my 35mm holes. He used a good stud finder to find the studs and dwangs in his house. I used a stick and a plumb line to find diagonals. From the IR pictures it now appears that I missed several diagonals with my technique. 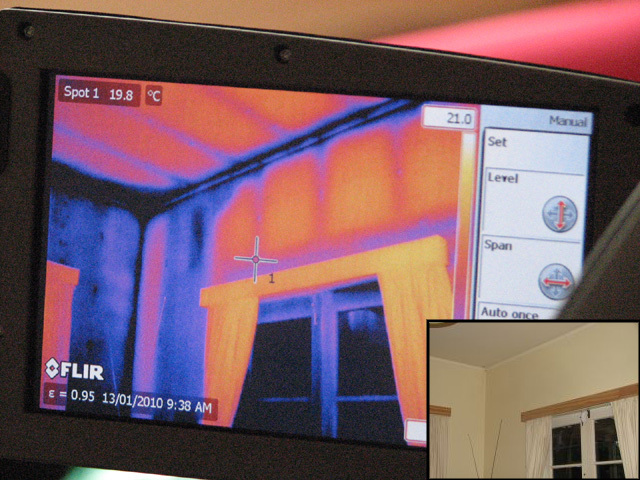 Then he used the infrared thermal camera to check his work. This is a very good quality checking system. In New Zealand there are companies who will do this for you. When I asked in 2009 they quoted $300 to do my house. In the loose-fill insulation industry this is classified as a thru-blower as opposed to the bypass-blower type where the insulation is fed into the output stream of the blower rather than into the suction end. Ironically the blowers used in many of the small commercial bypass units are actually the motor and blower units from domestic central vacuum systems. I think they call them blowers to avoid calling them suckers! I have a video of the bead going into a wall with a transparent cladding. The bead goes in at 70 litres/min. The gap at the top of one of the cavities was deliberate to demonstrate what happens if an installer doesn�t determine the frame location correctly and the injection hole ends up being at the bottom of a cavity and not near the top. The blower is still able to push the bead up 600mm but it was not done in this case. Despite the technical literature indicating a fill rate of about 70 litres/min the reality in that video is that it takes him 5 minutes and the withdrawal of the injection tube is particular tedious. This translates to a fill rate of about 11 litres/min or 1/6th of what we can achieve with the EPS bead. I notice on the U.K. websites of EPS bead injectors that they are all claiming that the material is %100 recyclable but they don�t say how they intend to do that when it is adhesively bonded. Sucking the loose bead back out is not an issue and the insulation industry already has equipment for doing this with cellulose. There are still a number of issues still to be resolved with recycled EPS bead and one that I came across recently is the concerns about the environmental prevalence of the fire retardant chemical (HBCD) that is unique to polystyrene. It looks like there is a need to separate the dust and fine particles from the beads during the processing stage. PolyPalace apparently has plans to do it at some point. * Much better at fill behind objects like pipes and diagonal bracing. * Much smaller infection hole so much quicker and easier to patch. Less risk to damage to the building associated with exterior injection. Less mess. * Cheaper, small, lighter quieter, less invasive equipment so much more opportunity to install from inside. * Material does not need expanding before installation so much easier to use material inventory to check that installation is complete. * Equipment could include quantitative flow rate measurement. * Only need to check the tops of each cavity with a thermal imaging camera and not the edges as well. * Much easier to thermal image than low density fibrous because of uniform density and low conductivity. * VERY FAST: so effort can be directed at the quality and completeness and not on doing it even faster. * CHEAP: so effort can be directed at the quality and completeness and not on the process of using as little material as possible. Can�t think of many negatives! The video shows recycled EPS bead being installed using a commercial grade compressor and a hand held vacuum-blower. The bead is going in at about 35 litres (compacted) per minute. We have been using the Vac-U-Gun in the field with a cheap $250 2.5 HP compressor from Bunnings running at about 80 psi. It is noticeably slower than with the commercial compressor and small compressors are very noisy but it is far easier and simpler than using a centrifugal blower and the compressor can be left outside. The blower is then light and easy to handle and quiet � no mechanical parts to stuff-up. Also very controllable in terms of flow rate and start & stop is instantaneous. Now that PolyPalace is supplying the beads in smaller bags it is a simple task to just shove the end of the hose into the bag. No double handling of bead and associated mess and it is easy to clear the nozzle and hose when it blocks. A 5 HP compressor would be needed to enable a continuous duty cycle on the air. 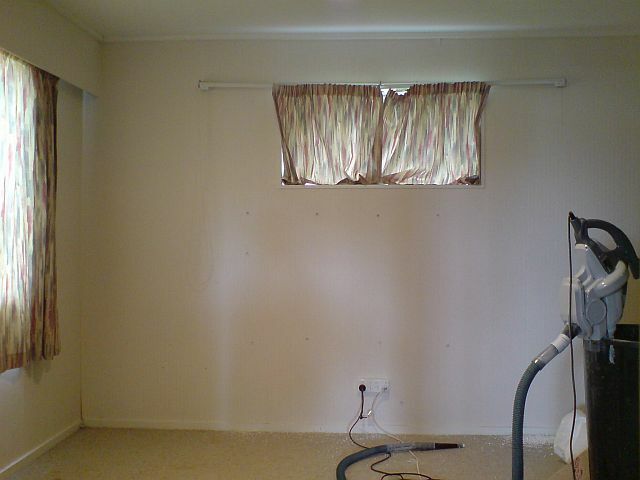 For DIY I would recommend drilling all the holes and then hiring a compressor as it would then only take about half a day for two people using two vacuum-blower guns to insulate the walls of a typical house. The compressed air vacuum-blower creates much less of a static charge issue than the mechanical thru-blower method. As an added bonus is that if needed there are simple/cheap anti-static air ionizing systems designed to work in conjunction with compressed air blowers.